Household Automation Ltd is always looking for ways to improve its service. We have come up with ‘The Panel’ a new approach to home automation installations. Our most recent commission was for a KNX lighting solution with smartphone control for a London town house. From the architects plans, discussions with the client and the site electrician we designed a KNX lighting solution that was delivered to site fully programmed and ready to be installed as a working set up. The concept of ‘The Panel’ is not new, however, delivering fully programmed and operational equipment to site is, in practice, something that is not easy to do. The hardest part of ‘The Panel’ is obtaining ALL of the necessary information to be able to fully program before installation. However, this in itself offers the benefits of finding and sorting out any problems up front rather than on site at the end of a project. In order to form a working solution not only is the KNX panel equipment such as; mains breakers, KNX power supply, KNX dimmers and relays and the web/smartphone server required but also all of the switches. 1st fix wiring is carried out by the site electrician who is provided with all documentation necessary, once the panel is powered he can physically test the circuits from the manual override switches on the front of the dimmers and relays. The panel comes with full smartphone app, simply connect the server to the network, download the free app any you have full smartphone control of your lighting. Ease of installation – an ideal solution for the electrical contractor, less time on site and more attention to detail before final testing and the panel leaving the workshop. 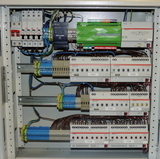 As well as the KNX lighting equipment which formed the basis of this panel, Household Automation Ltd has projects involving KNX heating and other manufacturers equipment.